This is a wonderful sparkle powder. It is feminine and fun to use. It can be used all over your body. When applied with makeup, it should be applied last so that the shimmer is not hidden by other products. I would not hesitate to recommend this to anyone looking to add sparkle to their skin. It will be an appreciated gift by any woman in your life. This "Shimmer Powder Puff" is a small puff on a stick. I call it my magic wand because I can see any little girl using this to play fairy queen or pixie. 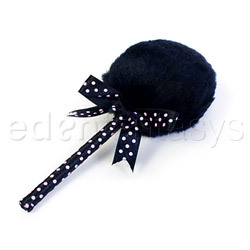 It is a 4.5" straw filled with powder and a 3" squared black puff attached. Where the straw attaches to the puff there is a very pretty black ribbon bow with pink dots that matches the color and design of the straw. The sole purpose of this powder is to add sparkle to your skin. It does not moisturize or cover any flaws that your skin may have. It is an addition to your regular makeup, not a replacement. For some women, they will want to use this all over the body and on the face with no other makeup foundation. That is fine. For anyone wanting to add it on top of their facial makeup, this works fine for that also. To start the flow of powder it is necessary to squeeze the tip of the straw and release some powder. I like that the powder flows from within because it helps to control where the powder goes and instead of flying all over the place (as I found with the I'm So Glam powder)it is contained. There are only 4 ingredients listed for this product: mica, titanium dioxide, magnesium silicate and iron oxides. Also mentioned is that the mixture contains no phthalates, no sulfates, not triclosean and is parabens-free. If you are a person with known sensitivities to any of these ingredients, or tend to have sensitive skin, you should test this powder on a small patch of skin and wait 24 hours before using it all over. If there is no reaction, you can be reasonably sure that you are safe. This powder is very smooth and fine. It feels softer and more smooth than cake flour. It is easy to apply by swiping the area you want to sparkle with this "magic wand". As it gently glides over the surface, it leaves behind a light coat of shimmery powder. The soft puff evenly spreads the powder as it touches your skin. You have a choice of gold or silver. The color refers to the sparkle/glow in the powder that light reflects off and in turn that is the color you see. Most of the powder "disappears" so it looks like you sprinkled some fine glitter. There is a very, very light nondescript scent to the powder. It is much lighter than baby powder which we are probably all familiar with. This product is not meant to be ingested and I did not taste it (I recommend that you do not taste it either!). Because this is small and will easily fit in tiny hands, precautions should be taken to prevent young children from using this unsupervised. It can easily be mistaken for a fairy wand and product wasted at best or being ingested by young children and causing sickness. That being said, properly used and with supervision, this is a product that can really be used by anyone. This powder is to give a sparkle to your skin and it does do that. Do not expect it to layer fragrance or hide any imperfections on your skin. It will not add color to your skin. It does exactly what it is supposed to do--it sparkles. The sparkle is really nice. Several people made favorable comments to me. It looks especially nice at night when you are in a dark spot and your skin catches some light. Bella Il Fiore has it together in their presentation. The powder puff is in a clear plastic bag which is inside a pink box with white and black trim. It matches the color of the puff itself. This is definitely a very feminine item--there is nothing about this that screams any thing but femininity. It is easy to access the powder puff from the package. This lasted through about a dozen or so uses and then it was empty. I gave the "magic wand" to a young neice. She loves it as much as we did!! tyvm for the great review! Does this cause any reactions? Thank you for viewing Shimmer powder puff review page!